For retirees downsizing from a 3,000 square foot home to a student needing to stash his or her belongings for the summer break, determining that you need a self-storage unit is a straightforward decision. A bit more difficult is deciding which size self-storage unit is the right size for your items. 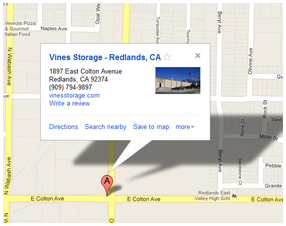 Vines Storage facility at 1897 East Colton Avenue, offers a broad selection of self-storage units ranging from 5' x 5' to 20' x 20' to meet everyone's storage needs. If you are new to self-storage, the expert staff at Vines Storage is ready to guide you in assessing your needs and determining the right size unit. The team also offers helpful tips on condensing and preparing your items for storage so you can maximize your space and best organize how items are arranged in the unit. To prepare, start by generating a list of everything you wish to store, and then prioritize it by level of importance. Also, indicate any items you may want quick access to. For personal items, a 5' x 5' (25 square foot) base unit at Vines Storage can comfortably hold the contents of one bedroom: a chest of drawers, a single mattress and box set, and nightstand. It is also the right size to stash seasonal outdoor or decorative items. For business storage, a 5' x 5' space can contain the contents of a standard office closet: files, books, an office chair, and several stacked banker boxes, with sufficient access to search and retrieve documents while they are in storage. The 10' x 20' units (200 square foot) can capably contain the contents of a standard four-bedroom home, including major appliances, furniture, and large stacked storage boxes. A 10' x 20' rental for business purposes can accommodate five office rooms including desks, computers, bookcases, and filing cabinets. It can also store a five-year supply of business or tax files. How long will I have my items in self-storage? Consider how long you plan to have your items in storage. Business or lifestyle changes may necessitate additional space, so try to plan with these possibilities in mind, so you do not need to move to a larger unit or rent a second unit to meet your increasing storage needs. How often will I need to access the storage unit? Will the storage unit be an interim holding space until you have a permanent house, or will it be an active unit where you will be regularly accessing the contained items? These factors will help you determine if you need to allow corridors to maneuver within the unit and deftly load items so those most frequently accessed are stored in the front of the unit near the entry door. Before reserving your self-storage unit, take a trip to Vines Storage to preview their various sized units and take photos of empty units to help you visualize what size will meet your storage needs. Call (909)389-6209 or visit at 1897 East Colton Avenue in Redlands.